When the Huguenot prince turned Henri IV of France finally mastered his realm by attending Catholic services in his capital city with the legendary words “Paris is worth a mass,” he was not merely overcoming some residual sectarian prejudice. There had been civil war in France for the best part of a century, and the bitterness of Catholic opposition to a Protestant king would eventually claim Henri’s life. And in that conflict, Paris herself was militantly Catholic. We have dealt elsewhere in these pages with those dramatic years, including Paris eventually falling into the hands of a despot clique of Catholic fanatics known as “The Sixteen” — who made so bold as to execute Catholic “politiques” of insufficient zeal. Just days after the signal hanging of jurist Barnabe Brisson in November of 1591, the city was taken back in hand by the Duke of Mayenne, a Catholic whom some radicals wished to advance to the throne. Mayenne preferred the role of kingmaker, stabilizing the long unrest of his realm. He was horrified by the Sixteen, and on December 4 he seized four of their number — Nicolas Ameline, Barthelemy Anroux, Jean Emmenot and Jean Louchart — and had them summarily hanged at the Louvre. The Sixteen’s days were done. Mayenne had the wisdom not to follow these exemplary executions with any provocative purges — neither of the other 12 nor other intemperate elements in town — but proclaimed a general amnesty. It was he who, over the months ahead, smoothed the way for Henri IV’s famous mass. 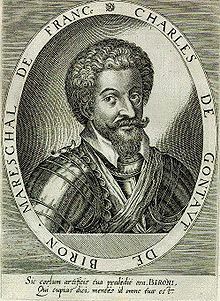 * The third Henri in the War of the Three Henrys was the late Duke of Guise, whom King Henri III had had assassinated. The House of Guise was characteristically an ardent Catholic party in these years, so his murder had helped sunder the allegiance of Paris to her king. The intrepid Huguenot commander Charles du Puy-Montbrun was beheaded on this date in 1575. This daring and energetic leader, the terror of the enemy in Dauphiny, had just defeated a large body of Swiss auxiliaries, upon whom he inflicted a loss of eight or nine hundred men and eighteen ensigns, while that of the Huguenots scarcely amounted to half a dozen men. But his brilliant success in this and other engagements had made Montbrun and his soldiers more incautious than usual. They attacked a strong detachment of men-at-arms, and mistaking the confusion into which they threw the advance guard for a rout of the entire body, dispersed to gather the booty and offered a tempting opportunity to the Roman Catholics as they came up. Montbrun, who, too late, discovered the danger of his troops, and endeavored to rally them, was at one time enveloped by the enemy, but would have made good his escape had there not been a broad ditch in his way. Here his horse missed its footing, and in the fall the leader’s thigh was broken. In this pitiable plight he surrendered his sword to a Roman Catholic captain, from whom he received the assurance that his life would be spared. The king and his mother had other views. Henry, on receiving the grateful news of Montbrun’s capture, promptly gave orders that the prisoner be taken to Grenoble and tried by the Parliament of Dauphiny on a charge of treason. Vain were the efforts of the Huguenots, equally vain the intercession of the Duke of Guise, who wished to have Montbrun exchanged for Besme, Coligny‘s murderer, recently fallen into Huguenot hands. Henry and Catherine de’ Medici were determined that Montbrun should die. They urged the reluctant judges by reiterated commands; they overruled the objection that to put the prisoner to death would be to violate good faith and the laws of honorable warfare. Catharine had not forgotten the honest Frenchman’s allusion to her “perfidious and degenerate” countrymen. As for Henry, an insult received at Montbrun’s hands rankled in his breast and made forgiveness impossible. Some months before, the king had sent a message to him in a somewhat haughty tone, demanding the restoration of the royal baggage and certain prisoners taken by the Huguenots. On hearing this, we are told, Henry swore that Montbrun should repent his insolence. Under these circumstances there was little chance for a Huguenot, were he never so innocent, to be acquitted by a servile parliament. Accordingly Montbrun was condemned to be beheaded as a rebel against the king and a disturber of the public peace. The execution was hastened last natural death from the injury received should balk the malice of his relentless enemies. A contemporary, who may even have been an eye-witness, describes the closing scene in words eloquent from their unaffected simplicity. He was dragged, half dead, from the prison, and was carried in a chair to the place of execution, exhibiting in his affliction an assured countenance; while the Parliament of Grenoble trembled and the entire city lamented. He had been enjoined not to say a word to the people, unless he wished to have his tongue cut off. Nevertheless he complained, in the presence of the whole parliament, of the wrong done to him, proving at great length his innocence and contemning the fury of his enemies who were attacking a man as good as dead. He showed that it was without cause that he was charged with being a rebel, since never had he had any design but to guarantee peaceable Frenchmen from the violence of strangers who abused the name and authority of the king. His death was constant and Christian. He was a gentleman held in high esteem, inasmuch as he was neither avaricious nor rapacious, but on the contrary devoted to religion, bold, moderate, upright; yet he was too indulgent to his soldiers, whose license and excesses gained him much ill-will and many enemies in Dauphiny. His death so irritated these soldiers that they ravaged after a strange fashion the environs of Grenoble. The death of so prominent and energetic a Huguenot captain was likely to embolden the Roman Catholic party, not only in Dauphiny but in the rest of the kingdom. In reality, it only transferred the supreme direction in warlike affairs to still more competent hands. The young lieutenant of Montbrun, who shortly succeeded him in command, was Francois de Bonne, better known from his territorial designation as Sieur des Lesdiguieres, a future marshal of Henry the Fourth. Although the resplendent military abilities of Lesdiguieres had not yet had an opportunity for display, it was not long before the Roman Catholics discovered that they gained nothing by the exchange. Lesdiguieres was as brave as his master in arms, and he was his master’s superior in the skill and caution with which he sketched and executed his military plans. The discipline of the Huguenot army at once exhibited marked improvement. 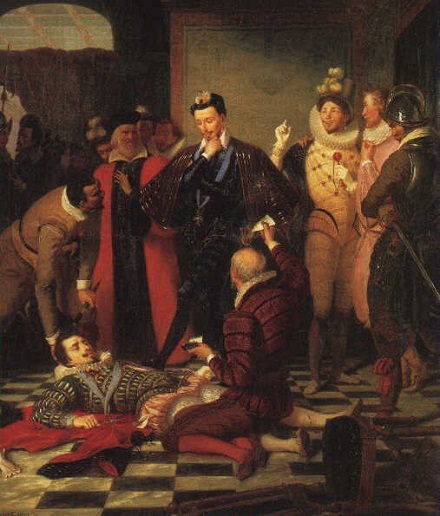 On this date in 1591, the summary execution of Barnabe Brisson and two other French doctors of law signaled the beginning of the end of France’s Wars of Religion. After the untimely death of Henri II in a freak jousting accident, his widow Catherine de’ Medici employed three frustrating decades shuttling the late monarch’s uninspiring offspring onto the throne only to see each in his turn die young and without issue. We are by these late years on to the last of Henri II’s sons — Henri III of France. Actually, Henri wasn’t the last: just the last left alive. He had a younger brother, Francis, Duke of Anjou, who dropped dead in 1584 of malaria and left Henri III as the only Valois male. The heir presumptive after Henri III was his Calvinist brother-in-law Henri of Navarre. Spoiler alert: by the end of this post, Henri of Navarre is going to get there as King Henri IV. The Catholic-vs.-Huguenot Wars of Religion had raged in France for many years but the last major installment of the bloody serial was the War of the Three Henrys: the two Henris aforesaid, plus the Duke of Guise, also named Henri — the standard-bearer of Catholic zealots. an admirable thing [it is] to view the ardor and the devotion of everyone in France, the air resounding with prayer and processions of our youth who are purified by our prayers and by the common voice which is spread throughout this kingdom; we demonstrate that the benedictions and maledictions of a people have great effects. This was a faction for whom Henri of Navarre’s prospective succession was absolutely intolerable, which makes it somewhat ironic that they themselves soon turned prospect into reality. King Henri III was a Catholic himself, of course, and this irreconcilable Catholic League was part of what you might call his base. 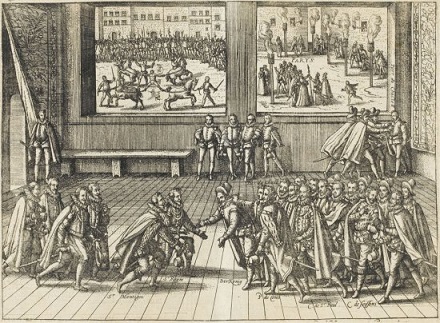 But though initially allied, the League’s attempts to dominate the young king led Henri III to execute a daring breakout: on December 23, 1588, he summoned the Duke of Guise to confer with him at the Chateau de Blois and there had his bodyguards murder Guise on the spot. The resulting fury of the Catholic League was so great that the king soon fled Paris and made common cause with Henri of Navarre. Now the civil war was the two Henris together — and the Catholic League opposing them. We come here to our date’s principal character, Barnabe Brisson (English Wikipedia entry | French), a distinguished jurist† in the Parlement of France. While most of this chamber followed the king out of Paris, Brisson chose to remain. “The Sixteen,”‡ the council of Catholic militants who now ruled Paris with the support of a populist militia, elevated Brisson to President of the Parlement. In 1589 the Henris besieged staunchly Catholic Paris in an attempt to bring the civil war to a close. In a classic Pyrrhic victory, the League defeated this attempt by having a priest assassinate King Henri. … and now we’re down to the last Henri. While this action did break the siege, and avenge the murder of Guise, it made Henri of Navarre into King Henri IV. (Told you we’d get there.) The Catholic League’s attempt to recognize the new king’s uncle, a Cardinal, as the successor went nowhere at all, and at any rate this man himself died in 1590. This succession greatly deepened the internal tension among Paris Catholics between the uncompromising men of the Sixteen and the moderate politiques, and the latter party’s interest in finding with the legitimate king a settlement that looked increasingly inevitable. After all, were these armed commoners really going to rule Paris indefinitely? The situation provoked the ultras among Paris’s ruling Sixteen to more desperate measures in a vain effort to maintain control. Their faction’s own post-Guise leader among the high nobility, the Duke of Mayenne, had refused inducements to seize the crown himself or to seat a sovereign provided by the League’s Hapsburg allies. He too was visibly sliding towards an accommodation with the heretic king. (He would reach one in 1596.) In much the same camp was an establishment figure like Brisson whose staying behind in Paris during the confused situation of 1588-1589 was scarcely intended to declare that his allegiance to creed surpassed all care for order. The man was a lawyer, after all. During Mayenne’s absence from the capital in the autumn of 1591, the Sixteen mounted a radical internal coup and attempted to purge the city’s moderates. Brisson was arrested walking to work on the morning of the 15th and subjected along with two other jurists to a sham snap trial. All three were hung by lunchtime, and per a proposal floated among the council that afternoon were the next morning fitted with denunciatory placards and displayed on gibbets at the Place de Greve. Their shocking exhibition was intended to incite a “St. Barthelemy des politiques” — a St. Bartholomew’s Day-esque pogrom against the politique moderates. But the Sixteen had badly misjudged the mood of the city. The crowd beheld the mangled corpses silently, full of horror or pity — emblematic of the turning-point France was nearing in its interminable confessional strife. Despite the Catholic League’s strength in Paris, most Parisians were losing their appetite for bloodshed. The Duke of Mayenne was back in the capital by the end of the month and underscored the coming arrangements by seizing four of the Sixteen for summary execution themselves. French speakers may enjoy this 19th century pdf biography of Brisson by Alfred Giraud. * “Du Contemnement de la mort. Discours accomode a la miserable condition de ce temps” (blockquoted section) and Replique pour le Catholique Anglois, contre le Catolique associe des Huguenots (D’Orleans quote). Both via Dalia Leonardo in “Cut off This Rotten Member”: The Rhetoric of Heresy, Sin, and Disease in the Ideology of the French Catholic League,” The Catholic Historical Review, April 2002. ** Also of interest: this 1908 silent film of the assassination of the Duc de Guise, scored by Saint-Saens. † Brisson’s dictionary of Justinian legal terminology remained in print until 1805. He also in 1587 produced a compilation of the laws of France as Le Code du Roy Henri III. ‡ The Sixteen were delegates of Paris’s quarters, assembled by the Duke of Mayenne. For detail on the composition and internal history of The Sixteen, see J.H.M. Salmon, “The Paris Sixteen, 1584-94: The Social Analysis of a Revolutionary Movement,” The Journal of Modern History, December 1972. § In the end, of course, an entirely unreconciled Catholic extremist assassinated Henri IV in 1610. On this date in 1612, the Scottish noble Robert Crichton, Lord Crichton of Sanquhar, swung for revenge served very cold. Sanquhar (alternatively, Sanquire) was a Scottish noble imported to the English court in the train of King James. Keeping up his swordsmanship in a practice bout with the fencing-master John Turner, Sanquhar had his eye put out by his opponent’s foil. While this injury was the source of the tragedy that ensued for both men, it is said — perhaps it’s just literary license — that it was the illustrious French king Henri IV who turned the situation deadly with a passing remark when Sanquhar subsequently visited Henri’s duel-mad realm to the effect that it was a wonder that the author of such a horrible wound still lived. Already down one organ for his trouble, Sanquhar was stung to discover emasculation stacked on his woes; even though it was several years after* the duel, Sanquhar began plotting to vindicate eye and honor alike. His Lordship had leaned on at least three underlings while engineering his belated revenge, and one of these wisely turned crown’s evidence against the rest of the quartet and hung the lot of his confederates. The headline case was of course the prosecution of the Baron Sanquhar handled personally by the king’s Solicitor-General, one Francis Bacon. At trial on June 27 — 47 days after the murder; two days before the execution — Sanquhar mounted a better defense for his honor than for his neck. After this loss of my eye and with the great hazard of the loss of life, I must confess that I ever kept a grudge of my soul against Turner, but had no purpose to take so high a revenge; yet in the course of my revenge I considered not my wrongs upon terms of Christianity — for then I should have sought for other satisfaction — but, being trained up in the courts of princes and in arms, I stood upon the terms of honour, and thence befell this act of dishonour, whereby I have offended — first, God; second, my prince; third, my native country; fourth, this country; fifth, the party murdered; sixth, his wife; seventh, posterity; eighth, Carlisle, now to be executed;** and lastly, ninth, my own soul, and I am now to die for my offence. But, my lords, besides my own offence, which in its nature needs no aggravation, divers scandalous reports are given out which blemish my reputation, which is more dear to me than my life: first, that I made show of reconciliation with Turner, the which, I protest, is utterly untrue, for what I have formerly said I do again assure your good lordships, that ever after my hurt received I kept a grudge in my soul against him, and never made the least pretence of reconciliation with him. Yet this, my lords, I will say, that if he would have confessed and sworn he did it not of purpose, and withal would have foresworn arms, I would have pardoned him; for, my lords, I considered that it must be done either of set purpose or ignorantly. If the first, I had no occasion to pardon him; if the last, that is no excuse in a master, and therefore for revenge of such a wrong I thought him unworthy to bear arms. Shorter Lord Sanquhar: I confess. 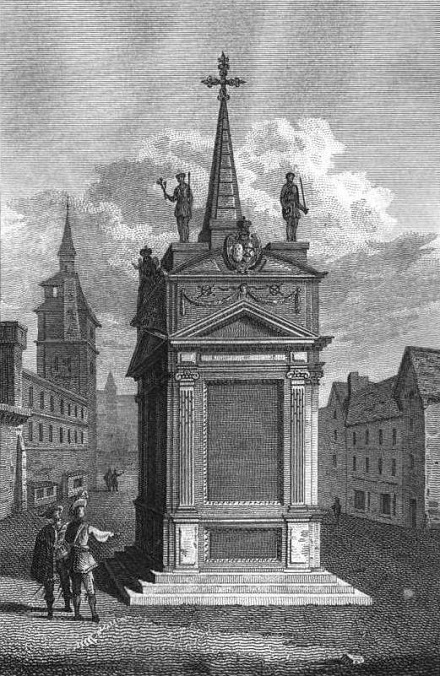 Needing not so much to contest the case at the bar as to narrate its intended moral, Bacon speculated that Sanquhar must have come by his egregious “affections of dwelling in malice, rather out of Italy … than out of any part of this island, England, or Scotland.” While this murder was not a duel, it sprang from a palpably similar place — and duels, just then taking on their recognizable ritual form, were furiously opposed by the state. Sanquhar had resided in Italy, but more than that, the term was code for the fencing experts who brought from the continent codes duello and mannerly rapiers and the prospect of destructive private vendettas. This was more than premeditated homicide; it was an arrogation of the king’s own prerogatives of justice and order. Nobleman and subalterns alike died on different gallows this date: Lord Crichton of Sanquhar hanged before Westminster Hall, while his two assassin-henchmen dangled on gallows at Fleet Street. * Sources propose various dates from 1604 to 1607 for the eye-foiling; Bacon in arraigning Sanquhar remarks that “it is now five years” since that happened. ** The man who actually shot John Turner. † “The Duel and the English Law of Homicide,” Oxford Journal of Legal Studies, Autumn 1992. 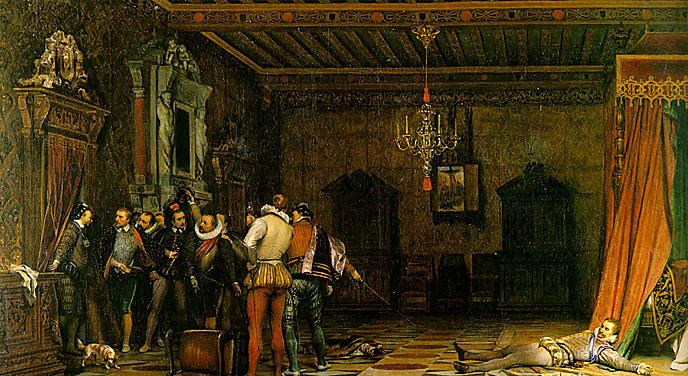 On this date in 1574, nobleman Joseph Boniface de La Mole was beheaded in Paris for a supposed plot against the king. As the year would imply, La Mole was a casualty of France’s decades-long Wars of Religion. Two years prior, in an attempt to cement an unsteady peace, the king’s sister Marguerite de Valois had been married off to the Protestant Henri of Navarre. As Paris teemed with Huguenots in town to celebrate the nuptials, the Catholic party sprang the infamous St. Bartholomew’s Day Massacre. As if things weren’t awkward enough with the in-laws, Henri was now made to live at the royal court, feigning conversion to Catholicism. His relationship with Marguerite went off to a rocky start; both took other lovers. Joseph Boniface de La Mole (English Wikipedia entry | French) was one of Marguerite’s. You’ll find this adulterous couple steaming up the screen in the 1994 film La Reine Margot, which is based on a Dumas novel of the same title. In real life, La Mole was 27 years Marguerite’s senior. Meanwhile, civil strife ebbed and flowed. Desperate to escape his gilded cage, Henri in 1574 was part of a Protestant coup attempt that boldly aimed to seize the sickly King Charles IX and his mother Catherine de’ Medici at Saint-Germain. The conspiracy failed, but its principals — including not only our Henri, but also the King’s Protestant-friendly brother the Duke of Alencon, and the Duke of Montmorency* — were too august for severe punishment. Catherine de’ Medici, whose children kept dying on her (Charles IX would do likewise in May of 1574), was desperately trying to navigate the civil war with a Valois heir in place who had enough political support to rule; going all-in with the realm’s Catholic ultras (most characteristically represented by the House of Guise, which wanted Henri beheaded for this treason) would have permanently alienated all the Huguenots. The likes of La Mole, however, were not so safe. 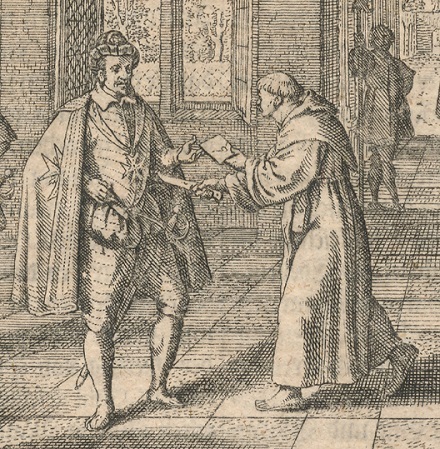 He and one Annibal de Coconnas, members of the court’s Huguenot circle who “had nothing of the divinity that hedged the princes of the blood,” were seized on April 8 and interrogated for an alleged scheme to murder the sovereign — possibly at the instigation of the Guises, trying to implicate through this pair the more powerful Huguenot lords. After the inevitable blade fell on them, Marguerite supposedly kept her former lover’s severed head in a jeweled box. But the nobleman had at least the consolation of a rich literary afterlife. Besides the Dumas novel aforementioned, the La Mole family — our man’s supposed descendants — feature prominently in Stendhal’s The Red and the Black. ‘Let us take a turn in the garden,’ said the Academician, delighted to see this chance of delivering a long and formal speech. ‘What! Is it really possible that you do not know what happened on the 30th of April, 1574?’ ‘Where?’ asked Julien, in surprise. ‘On the Place de Greve.’ Julien was so surprised that this name did not enlighten him. His curiosity, the prospect of a tragic interest, so attuned to his nature, gave him those sparkling eyes which a story-teller so loves to see in his audience. The Academician, delighted to find a virgin ear, related at full length to Julien how, on the 30th of April, 1574, the handsomest young man of his age, Boniface de La Mole, and Annibal de Coconasso, a Piedmontese gentleman, his friend, had been beheaded on the Place de Greve. ‘La Mole was the adored lover of Queen Marguerite of Navarre; and observe,’ the Academician added, ‘that Mademoiselle de La Mole is named Mathilde-Marguerite. La Mole was at the same time the favourite of the Duc d’Alencon and an intimate friend of the King of Navarre, afterwards Henri IV, the husband of his mistress. On Shrove Tuesday in this year, 1574, the Court happened to be at Saint-Germain, with the unfortunate King Charles IX, who was on his deathbed. La Mole wished to carry off the Princes, his friends, whom Queen Catherine de’ Medici was keeping as prisoners with the Court. He brought up two hundred horsemen under the walls of Saint-Germain, the Due d’Alencon took fright, and La Mole was sent to the scaffold. In Stendhal’s novel, it is Julien’s sexual conquest of the pretty young Mathilde de La Mole that sets in motion Julien’s ruin and execution. Joseph Boniface de La Mole’s lover fared far better than that of his fictional descendant. Henri would eventually make his escape after all, and through fortune and intrepidity made Marguerite the Queen of all France** when he decided at last that Paris was worth a Mass. * The man in our story was the second Duke of Montmorency; his nephew, the fourth duke, was beheaded in 1632. ** The marriage was never comfortable, and Henri and Marguerite continued to live and love separately until they finally annulled the union in 1599. 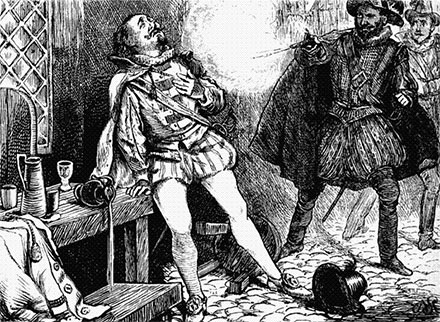 On this date in 1610, the fanatical Catholic who assassinated Henri IV of France was ripped apart on the Place de Greve. The road to this man’s calvary begins long before his infamous crime, even long before the birth of his illustrious victim. 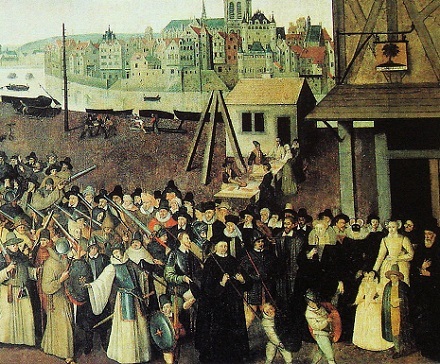 The Protestant Reformation — so richly represented in the executioner’s annals — had fractured France in the 16th century. After decades of voluptuously indecisive Catholic-versus-Hugeunot slaughter, matters had finally been settled by the man upon whom French absolutism would erect its (ill-fated) edifice. Henri IV, the first Bourbon monarch and a Huguenot, had unified the country by the sword, capped by his memorably politic conversion to Catholicism in 1593 to win over the holdout capital of Paris — the occasion of his understated declaration that “Paris is worth a mass”. Did you catch that last image? Henri’s fine gesture of sectarian triangulation and the reign of relative calm it inaugurated were naturally resented by godly partisans of both camps who either considered his conversion a betrayal or considered the king a closet Protestant. At the crazed end of this latter spectrum, we meet our day’s principal, Francois Ravaillac. It is only right that such a contemporary-sounding lone nut story ought to have a vigorous conspiratorial counternarrative. There has always been a strong suspicion that behind Ravaillac’s hand was the work of the scheming Catholic Duc d’Epernon, perhaps even with the complicity of Henri’s wife Marie de’ Medici, who had conveniently been crowned as queen the day before the murder** and promptly teamed up with Epernon to cement an alliance with a traditional French rival, the ultra-Catholic Habsburgs. all of [her] actions were prejudicial to France … Marie de’ Medici wasted the wealth amassed by Henri IV. ; she never purged herself of the charge of having known of the king’s assassination; her ‘intimate’ was d’Epernon, who did not ward off Ravaillac’s blow, and who was proved to have known the murderer personally for a long time. … [T]he victory Richelieu at last won over her (on the Day of the Dupes) was due solely to the discovery the cardinal made, and imparted to Louis XIII, of secret documents relating to the death of Henri IV. The historical jury is out on that question, presumably for good. Children made a bonfire and flung remains of Ravaillac’s body on it. According to one witness, Nicholas Pasquier, one woman actually ate some of the flesh. The executioner, supposed to have the body of the regicide reduced to ashes to complete the ritual demanded by the law, could find nothing but his shirt. Ravaillac was the last Frenchman drawn and quartered for a century and a half — but his punishment as a regicide formed the precedent for that handed down in 1757 to Damiens. * No need, though, as Francois wasn’t hard to catch: he stepped up to Henri’s carriage when it was caught in a traffic jam on May 14, 1610, and stabbed the king to death plain as can be. He was lucky (sort of) to avoid a lynching. ** Rubens later painted a gaudy celebration of this event.